My grandfather was Italian. To drive this point home his parents named him Giovanni in case there would be any future question about his heritage. He was also born on St. Patrick's Day. It may have been for that reason or for the 2.6% Irish ancestry he had that he was given the middle name of Patrick. In honor of my grandfather's tiny amount of Irish heritage (and by extension my even smaller amount of Irish heritage) I made the traditional corned beef and cabbage for tonight. 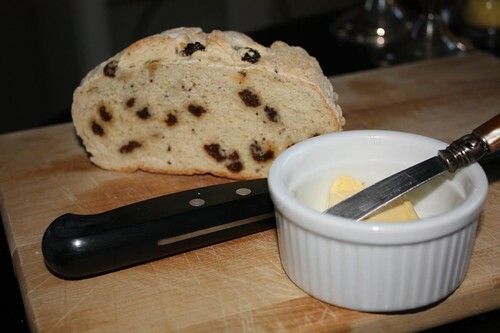 Traditional, of course, in the American-Irish sense, not in the sense that people in Ireland have ever heard of this. However, this year, I wanted to change it up a little bit. Jen was skeptical of this as she is about everything I make for dinner every day. 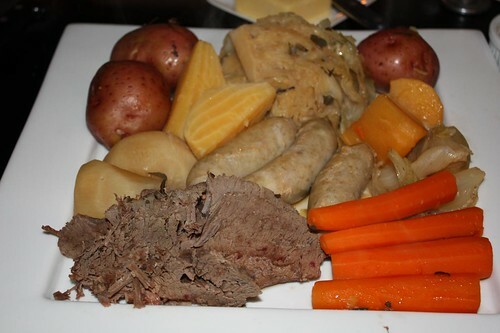 It just occurred to me yesterday that limiting corned beef and cabbage to merely corned beef, cabbage, potatoes, and carrots was a huge missed opportunity! With so many root vegetables nearing the end of their cellar-life we should be celebrating the end of the winter with a medley of root vegetables. 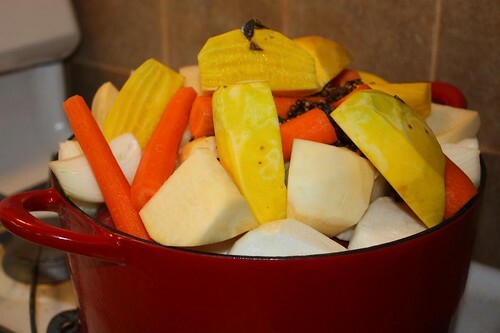 The problem with root vegetables is that even buying them one by one still gives you an enormous quantity -- some would say too much for one single pot. 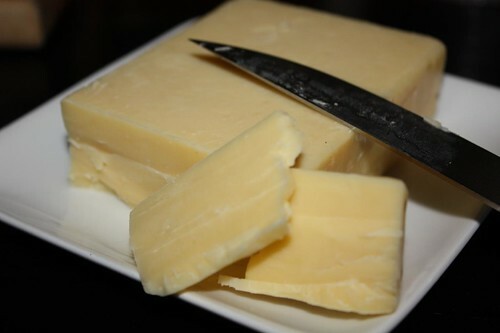 Due to the vast quantity of vegetables that needed to be thoroughly boiled we started off with some of the remaining soda bread and Kerrygold butter along with some fantastic Killaree Irish Cheddar. The Killaree is so cheap and and so good that you actually feel guilty while consuming it. 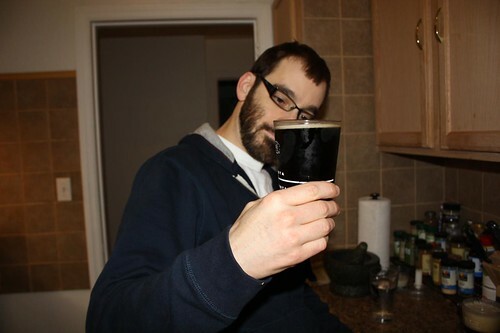 I had the brilliant idea to make a Black & Tan (or Half and Half, or whatever you want to call it) using local beers. As you can see from this picture it was a huge failure. I used Saranac Limited Edition Irish Stout and Brooklyn Lager which apparently share too common a density and color to make this successful. Delicious but not really successful. Next time I'll try something a little lighter in color than Brooklyn Lager. But maybe the Saranac stout was too heavy. Maybe there's a reason people do this almost exclusively with Guinness and Harp and I should just accept that. However, I'm far too stubborn to accept anything of the sort. Normally I just cook up the corned beef, cabbage, potatoes, and carrots in the same pot with the corned beef spices. This year I tried something different and added a couple of the Saranac stouts and some beef stock. I also added a few different root vegetables: rutabaga, turnip, golden beets, and onion. It was a good addition to the potatoes, cabbage, and carrots. Toward the end I also tossed in some Irish bangers. Why have one meat when you can have two meats? Besides, I was still feeling bad about the sausages I had to throw out the other day after our power outage. I didn't want to serve this with just any old mustard. 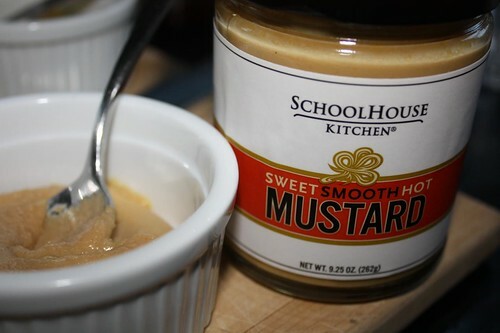 I spent the day on Long Island and picked up this Sweet Smooth Hot Mustard from SchoolHouse Kitchen from Brooklyn, NY. It's probably not the most traditional mustard to serve with this dinner but the mustard itself is very unique. Plus part of the proceeds from this mustard go to help educational organizations. You can't say that about Grey Poupon! Part of Grey Poupon's proceeds go to helping obnoxious rich guys pull up alongside you in their limo and ask you if you have any of their favorite mustard. Hardly as good a charity in my opinion. If you get in the Irish mood again any time soon, my family's deli sells bangers, and other assorted Irish goods, and it's a teeny stroll away for you! I love the Irish and English goods there! I've made use of the tea biscuits and Lyle's Golden Syrup on several occasions! Genuine Bangers? A hop skip and a jump away? Sounds like an excuse to bring another load of Jen's old stuff eastward.